As the enemy fleet approaches, the wind turns to your favor. You raise the sails on your ships using its momentum to ram your opponent’s ships, turning them to debris on the open water. 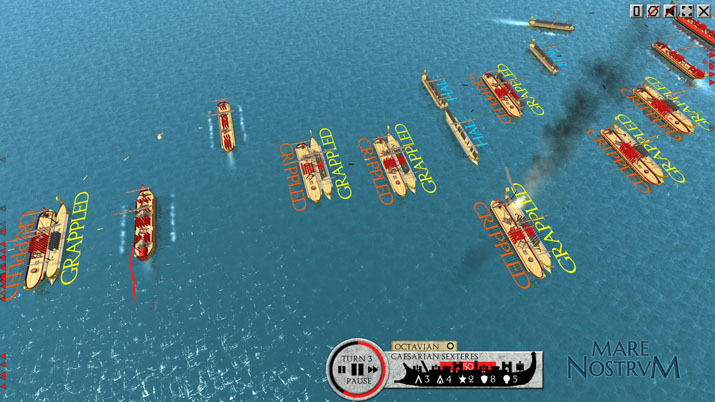 From Developer Turnopia, Mare Nostrvm is a hex-based naval strategy game set in the ancient Roman era. Using concurrent turns between opponents, your squadrons of ships engage in nail-biting naval combat with historical enemies and realistic ship-to-ship combat. Mare Nostrvm’s campaign is a historical retelling of specific naval operations in Roman antiquity. Twenty-four battles dispersed between nine time periods, where you will play as one of the ancient empires of the Mediterranean. Victory hinges upon you destroying, capturing, or debilitating the majority of your opponent’s ships. Defeats stick with you, and you will be allowed to continue the campaign. Depending on how well you do, your progress will be awarded to you in gradients from minor to major. You will begin each map with a fixed number of ships in a set formation. Certain ships are designated as commanders, giving you an area for other ships to receive commands. If a ship leaves this area, they will attempt to make their way back to their designated commander. Commands are given to squadrons as a whole, or to ships individually. Setting movement with a commander sets all other ships with the same path, highlighted in bright green lines on the map. You can raise sails if the ships have them, or choose to grapple or ram as attacks. Grappling works best when alongside enemy ships, while ramming is best suited with speed and head on collisions or raking an opponent's oars. Each ship has a certain amount of manpower associated with it, visually represented by small colored pegs on the ship. Ship crew can become fatigued if you overextend their movement, or row the ship in reverse. When two ships engage each other, these tiny pegs will fling arrows and fire at the enemy ships, or attempt to grapple and capture it. As manpower is killed off, the amount of speed and strength of the ship diminishes. If all the people are killed, the ship no longer moves. When ships are disabled they become debris, which clogs the battle field, forcing you to change routes, or maneuver around former ships. As battles wage on, islands of debris become formidable obstacles to lure your enemies around. Small things like this create tactically rich battles, rewarding innovative and clever decisions and opportunities. Large battles can become tedious at times. When ships are bunched together, trying to find paths of movement between the debris and overlapping movement lines of other ships can become frustrating and overwhelming. However, there is a certain thrill at executing a clever maneuver of ships, bringing down a mass of enemies through manipulating your ships wisely, and outthinking your opponent. Pulling unique maneuvers based off the historical tactics of that empire and adapted to the situation. Campaign and Skirmish matches can get very interesting as fleets clash together and victory is hard pressed up until the last turn. Few matches left me predicting the victory in advanced, making my decisions and choices all the more meaningful as the turns crept onward. Skirmish and multiplayer modes allow you to choose your ships based on point-buy rules. Ships can be equipped with stronger manpower, towers, sails, or firepots. This lets you create truly unique naval fleets with massive amounts of customization. At the start of each map, you can preset your formation of ships, which can take awhile at first as you learn how the ships move on the board. Map choices in skirmish mode cover most of the campaign maps, which aren’t that interesting to begin with. They mostly consist of a few land masses near the borders of the map, giving you ample room to maneuver your ships where it counts. You can also choose the wind strength and overall direction, along with atmospheric conditions. Graphics are fine for what the game is, I spent most of my time zoomed out, with a full view of the battle scene. Zooming in on the ships is exciting, but with few indicators telling you which ship is yours, you’ll spend most of your time making decisions zoomed out where the graphics become superfluous as the ships are replaced by brightly colored arrows. Since Mare Nostrvm is a tactical thinking game, graphics are beside the point. You could strip down all the graphics and you’d still have an amazing game with amazing mechanics that create tactically rich situations. Mare Nostrvm is an excellent game with a keen sense of balance between all the mechanics at work. Skirmish and Multiplayer modes give tons of replay value to an already great game. For historical enthusiasts or naval buffs, it's one you’ll want to look into. Turn-based tactically rich naval combat offers hours of entertaining and historically informative gameplay.